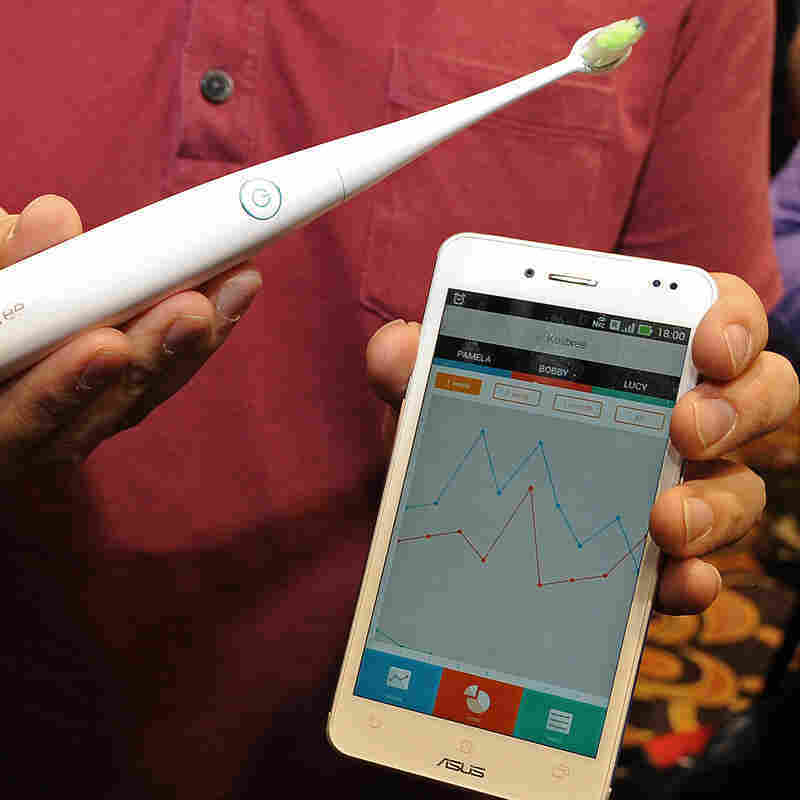 CES 2014: Toothbrush? Bed? Car? Put Some Internet On It : All Tech Considered The Consumer Electronics Show is the tech industry's annual electronics showcase in Las Vegas, where companies are showing off their latest and greatest gadgets, like Internet-connected toothbrushes (ideal for hygiene-concerned helicopter parents) and cars that come equipped with a 4G cell connection. The Kolibree toothbrush, billed as the world's first Internet-connected toothbrush, monitors dental hygiene. 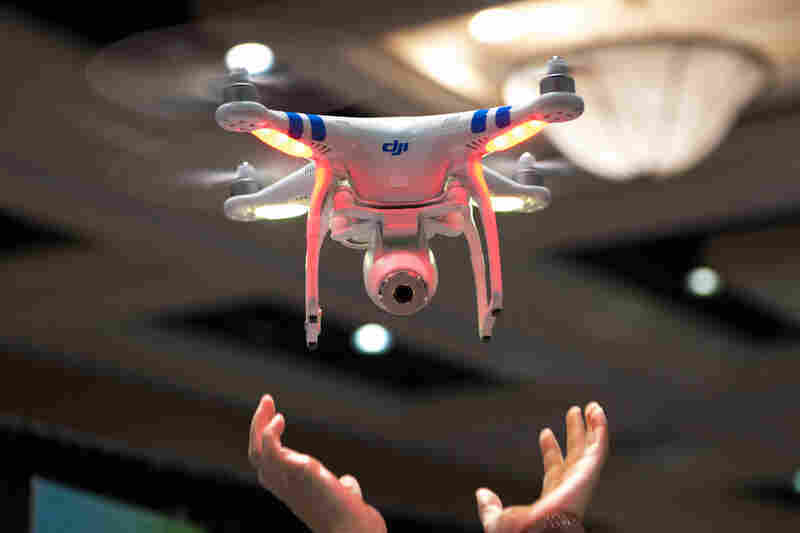 A DJI Phantom 2 flying camera is presented at the media event prior to the International CES show opening in Las Vegas. 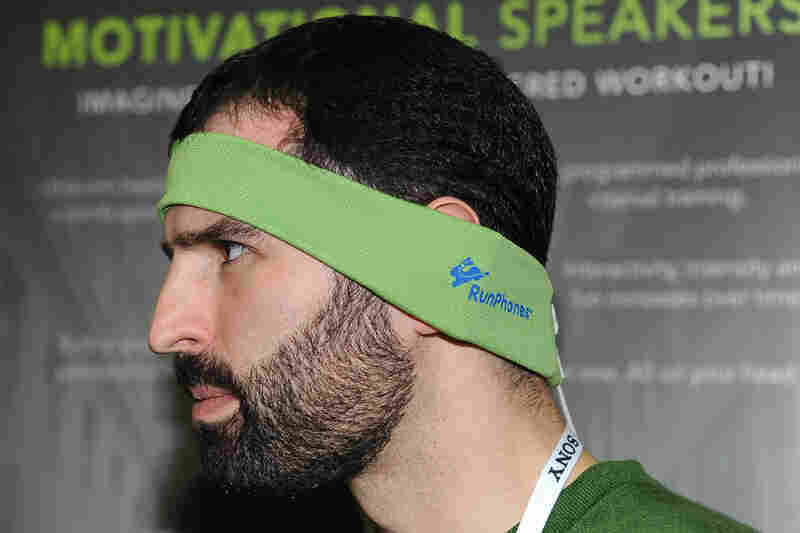 Casey Macioge with AcousticSheep LLC wears RunPhones, a moisture-wicking athletic headband with removable headphones. 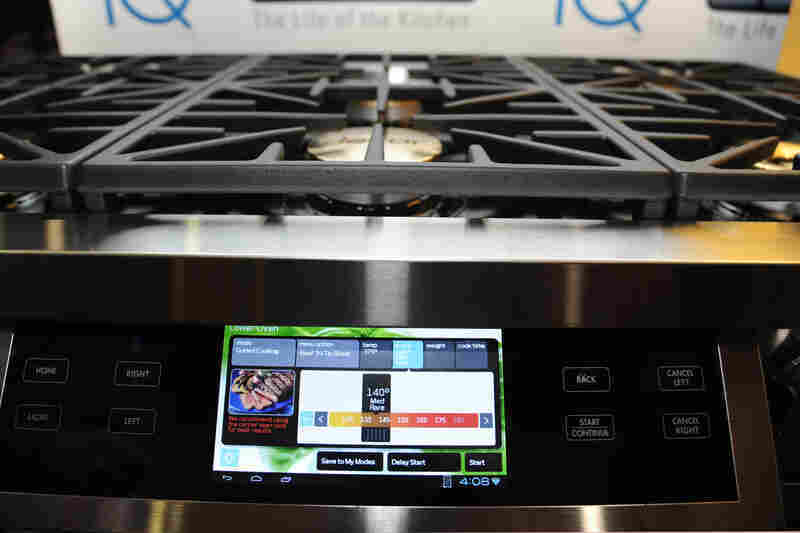 The Discovery iQ 48 Dual-Fuel Range from appliance maker Dacor has a 7-inch Android 4.0 tablet built into the front panel, which runs apps, connects to the home network and controls all of the functions of an oven. 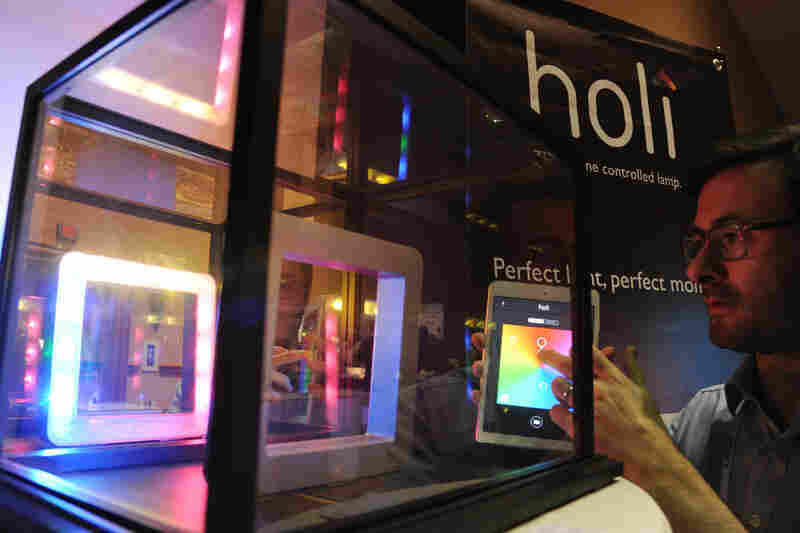 Gregoire Gerard demonstrates the Holi lamp, an iPhone- and iPad-controlled light that changes colors. The product's U.S. distribution is planned for March. Connected cars, 3-D printers, high-definition televisions, Bluetooth speakers, robots and toys hawked to retail buyers and the thousands of reporters who clog the 2 million square feet of exhibition space. NPR technology correspondent Steve Henn is in Las Vegas to cover the show, and he shared some of the highlights of the blowout so far with NPR's Audie Cornish. The show hasn't even technically started yet — it runs from Tuesday through Friday — but small tech companies previewed some of their products for reporters Monday morning. "The place was just full of little companies that were pitching their latest and greatest gadgets," Henn says. "These aren't the Samsungs and Sonys of the world — these are really closer to startups." Among the offerings was an Internet-connected toothbrush that measures how long and perhaps how thoroughly you've brushed, in an effort to improve your oral hygiene (although Henn thinks it might be more useful for checking to see if your kids are telling the truth when you ask "Have you brushed your teeth?" as they run out the door to school). There was also a robot called Mother that sends you reminders to get more sleep or take your vitamins; a cash register called Clover designed for small businesses; and toys that you can control with your iPhone. Then there's an Internet-connected sleep monitor made by Withings, a French smart-device company that gained fame a couple of years ago for its Internet-connected scale. Raphael Auphan with Withings explained that the device is placed in the user's bed to detect movements, heart rate and breathing rate. It monitors sleep stages and aggregates the information on a phone app. What happens if you're doing, well, other things in bed that you don't want to be monitored? "If you're ever [in a] moment of sensuality and you don't want to have anything monitored, you basically caress the device on the side and it will switch off," Auphan said. Some of the more major companies are already presenting their own developments. On Monday, Google announced a partnership with carmakers Honda, GM, Audi and Hyundai and mobile chip manufacturer Nvidia to form what they're calling the Open Automobile Alliance. The idea is to let Android app developers know what tools they have to work with. "Lots of people really endanger themselves and others by trying to text or get navigation directions from their cellphones," Henn says. The alliance partners "want to create a common set of standards that will be built into all of their cars that will allow Google's Android software to work seamlessly and safely within automobiles," he says. And on Sunday, GM announced that AT&T will equip new Chevrolet models with a 4G cellular connection. It's a sign of the times: Tech companies are finally trying to break into the automobile industry. "For years, the car was this area that was more or less cut off from the digital revolution," Henn says, "and that, I think, is about to change." Another area of interest this year? Wearable technology. For example, Henn is expecting an announcement from Intel, which has so far struggled in the mobile technology business, explaining its business plan for wearables and "how these watches and glasses could change how we live," he says. But smart watches and glasses aren't the only things to look out for, Henn says. "One of the show organizers told me about a company that apparently is putting a temperature sensor in clothing, and then the clothing changes thickness depending on how warm or cold it is outside."